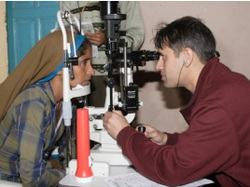 The Barsana Eye Camp is the rarest of social work efforts—spiritually conscious doctors administering to the needs of villagers in the heart of rural India where good medical facilities are a rarity. It all began in 1989, when a group of young medical students from Mumbai, who had just gotten their degrees, visited the holy town on pilgrimage. Spiritual care is a major part of the Barsana Eye Camp. From 6am until 10pm, as the staff work tirelessly, a kirtan party chants spiritual mantras, which can be heard throughout the operating theater, examining area, and wards. Susan has been traveling every year to India to look over this project. She has played an indispensable role in guiding and spiritually motivating the staff. She provides spiritual counselling for those who feel anxiety about their health and upcoming surgeries. "It is amazing and inspiring how Susan can connect with the local folks in such a seemingly alien environment. It only goes to show that spiritual compassion transcends the boundaries of place, culture and religion."